In this collection of three deeply bizarre yet comedic novellas, Hemmi delicately interweaves delightful commentary with narratives contemplating the interconnectedness of life. 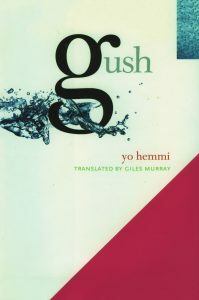 ‘Gush’ (on which Shohei Imamura’s 2001 film Warm Water Under a Red Bridge was based) recounts the narrator’s relationship with a beautiful young woman who suffers from a mysterious condition that causes her body to fill with water, and only performing ‘shameful acts,’ like shoplifting imported cheese or making love, allows the water to be released. But as summer wanes into fall and the waters run dry, their relationship develops a divergent sense of urgency that neither of them could have expected. Imbued with the same magic and mystery, the other novellas follow two narrators’ extraordinary encounters with passing strangers. In ‘Night Caravan,’ a man embarks on a midnight journey in the company of two Vietnamese prostitutes and their pimp. Faced with fear and regret, they make their way through the night, blinking numbly at any light that dares shine down upon them. Finally, ‘Piano Wire’ tells the story of how one family’s struggle with cleanliness and order is radically changed when a mysterious teacher shows up on their doorstep. With prose as restless as it is witty, Yo Hemmi crafts a comedic work of serious proportions.